I’m going to pump! YOU! UP! Welcome to the Bodē by Lex app, where you’ll find a fun new way to workout. Getting in shape and maintaining a healthy lifestyle has never been easier with quick and effective workouts, flexible programs, and a community of supportive, like-minded women rallying behind you on the same journey. I’ve trained millions of women through my Alexa Jean Fitness community and now I’m bringing my proven system to an easy-to-access fitness app. Programs are suitable for all fitness levels and can be done literally anywhere you are! ALL NEW programs offering a variety of HIIT, bodyweight, circuit and barre training that have been thoughtfully designed to maximize metabolism, tone your muscles, and transform your body. Start your 7-day free trial now to create your profile, join the community and select a program. Everyone receives a one-time free week and you’ll automatically get access to EVERYTHING inside the app for the week. We’ve found that community is essential for long term success. The Bodē by Lex community makes it easy to find your tribe. Create a profile, connect and follow other women and not only gain accountability, but have fun competing on the leaderboard. Did I mention you can also coordinate meet ups and hangouts with your new gal pals!? Bodē by Lex was built around you, at every stage of life including pregnancy. 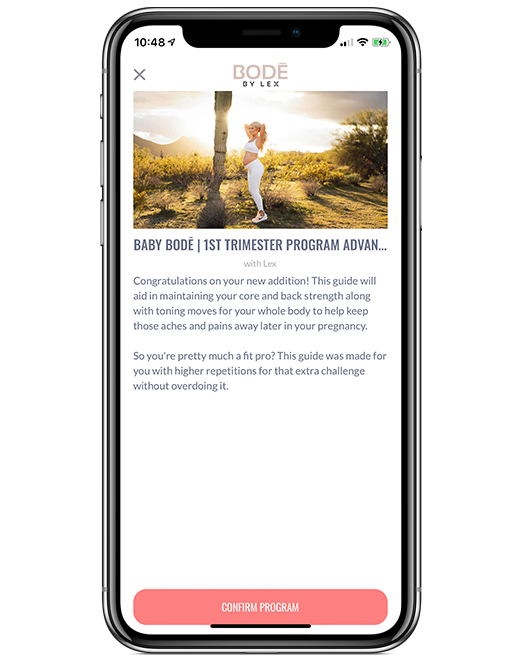 With pregnancy specific guides for each trimester of pregnancy and post delivery, you can be sure that you’re promoting a healthy lifestyle for you and your growing baby. Bodē by Lex includes delicious recipes curated by me! I believe in creating a healthy lifestyle instead of a crash course fad-diet to ensure we’re instilling lasting, healthy habits. Inside the app you’ll find healthy AND delicious recipes. Everything from late night snacks and one pan dinners to elaborate meals. And don’t worry, I won’t teach you how to count calories so put down the calculator and enjoy!